Combining the utmost in quality with brute strength protection, the MagnaVault series is designed to give you the peace of mind that comes from knowing your valuables are well protected. 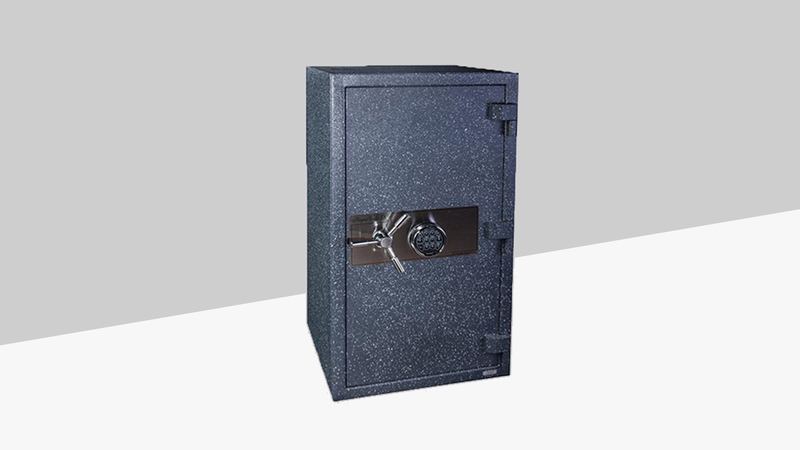 The MV Safes are built with heavy composite construction and a massive 4 1/2" inch think door loaded with up to 5 angled hardplates and tempered glass and mechanical re-locking devices to provide premium burglary protection. In addition, large hinges, quality construction and UL-RSC burglar protection. Fire Insurance Labratories tested for 105 minutes at 1200 degrees, maintaining an internal temperature under 350 degrees. Body is six sided 2 inch think composite construction with one recessed mounting hole. 11/8 inch diameter chrome plated locking bolt. Up to 5 1/4 inch hardplates mounted at angles inside the door and body to provide maximum drill attack prevention. Up to 4 relocking devices connected to glass plate will protect the safe from attacks on the lock. A reinforced solid continuous bolt locks on the hinge side of the door ensuring security even if the hinges are cut off. Two layers of intumescent door seal that swells at high temperatures to seal the door from fire and smoke. Painted a tan color with fabric covered shelves and back of door. A UL-RSC burglar protection ensures years of use while the upgrade options for electronic locks give an impressive amount of flexibility for access control, auditing, time delays and other advanced features.